Marvin is free and will spend Father’s Day with his family! Today Marvin Corado, an undocumented immigrant originally from Guatemala, was finally released after being detained for more than six months at a private immigrant detention center for only driving without a driver’s license. Marvin will be able to spend Father’s Day with his wife and his 5 year old daughter who is a U.S. citizen, while hundreds continue unnecessarily separated from their families due to the Administration’s failure to stop the detention and deportation of immigrants. A national report “Restore the Promise of Prosecutorial Discretion” (Exec Summary attached) released earlier this week, outlines several shocking statistics about the scale of the failure of the Department of Homeland Security’s (DHS) implementation of Prosecutorial Discretion (PD) one year after it was announced. In June 2011, DHS announced a new policy that was supposed to focus immigration enforcement on the “worst of the worst” and spare individuals who have been in the U.S. for years, raising families. However, only 1.5% of the 300,000 cases reviewed were closed and Prosecutorial Discretion has been poorly utilized to release fathers, mothers and DREAM Act-eligible students. According to the report, “DHS is threatening to undermine the credibility of President Obama’s policies and standing with Latino and immigrant communities nationwide”. Marvin’s case was featured in the report as a clear example of broken promises. Marvin came to the United States 12 years ago, is a father of a U.S. citizen, has no criminal record and was detained only for not having an ID. All these characteristics made him eligible for Prosecutorial Discretion. However, deportation officers tried several times to deport him, including the day before he was released. This does sound like great news for thousands of families! However, there is still confusion and misinformation on how and when those currently in deportation proceedings can benefit from this.We need to understand fully what this announcement really means, in order to inform correctly our communities and to demand that it is implemented appropriately. To understand what this announcement IS and what it ISN’T, read this Consumer Advisory by the American Immigration Lawyers Association. 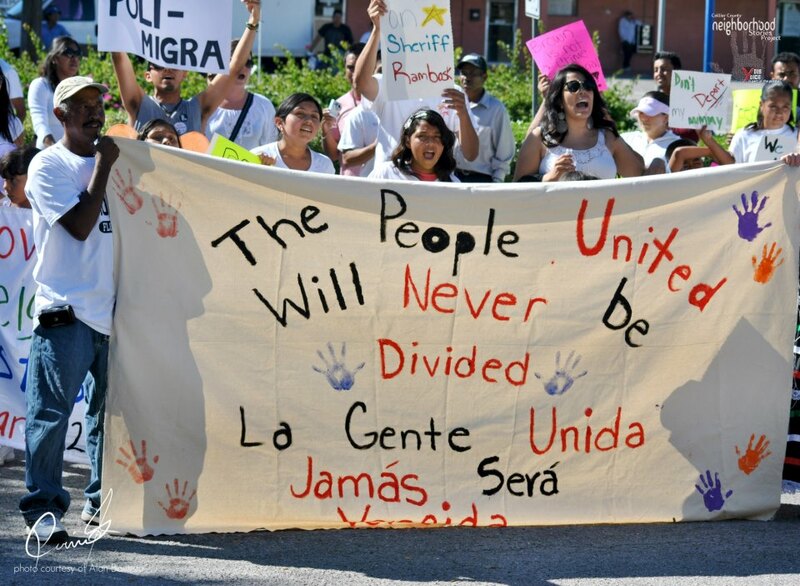 El 1 de Septiembre de 2011, día en que Alabama implementaría una ley antiinmigrante más fuerte que la SB1070 de Arizona y bajo un cielo amenazante por la lluvia, no impidió que un grupo de activistas afros e hispanos del sur de Florida se unieran para alzar sus voces por la construcción de un centro de detención en el condado de Broward con capacidad para 2000 camas, uno de los más grandes del país. Alrededor de las 3:00 pm comenzaron a llegar pequeños grupos de las distintas organizaciones que con carteles, y al grito de “CCA Go Away”, reflejaban la disconformidad ante la población que circulaba en sus autos sobre Griffin Rd, haciendo que muchos de ellos desconcertados se detuvieran a preguntar qué sucedía, ya que sus líderes comunales se niegan a hablar. Después que la administración del Presidente Obama anunciara cambios en las políticas de deportación, inmigrantes en todo el país siguen siendo detenidos y deportados. Empresas como la Corporación de Correccionales de America (CCA) y el grupo Geo, son parte del mismo negocio: la encarcelación de inmigrantes. Por ese motivo apoyan leyes como la de Arizona y programas como Comunidades Seguras, con el fin de que sus cárceles no permanezcan vacías. Por eso digamos “NO a la construcción de cárceles Si a la construcción de escuelas”. Levantemos nuestras voces, CCA go AWAY. *Rosana es miembro del Centro de Trabajadores de Miami. On September 1, 2011, the day Alabama was expected to implement an anti-immigrant law stronger than Arizona’s SB1070 and under a threatening sky, the rain did not stop a group of Afro and Latino activists in South Florida come together to raise their voices against the building of a new detention center in Broward County with a capacity of 2000 beds, one of the largest in the country. Around 3:00 pm, small groups of the various organizations started arriving with banners and shouting “CCA Go Away,” reflecting their opposition to the people that drove by in their cars on Griffin Rd. Many of them, surprised, stopped to ask what was happening since their community leaders refuse to speak. After Obama’s administration announced changes in the deportation policies, immigrants across the country continue to be detained and deported. Companies like Corrections Corporation of America (CCA) and the GEO Group are part of the same business: the incarceration of immigrants. That is why they support laws like Arizona and programs like Secure Communities (S-Comm) so that their prisons are always full. Let’s raise our voices, CCA go AWAY. *Rosana is member of the Miami Workers Center.